...and now look at today's card above. It's hard to imagine these images are part of the same set! The balloons have a children's 50s retro feel whereas the flowers are much more grown-up and feminine. The sun has been out in Buckingham today and, for the first time this year (roll of drums please...), I went outside without my gloves on without feeling cold!!! YAY!!! I enjoy reading the blogs of crafters all over the world and it seems that everyone has been waiting for the spring to arrive. I just want to say - there's hope ladies! I like both of your cards. 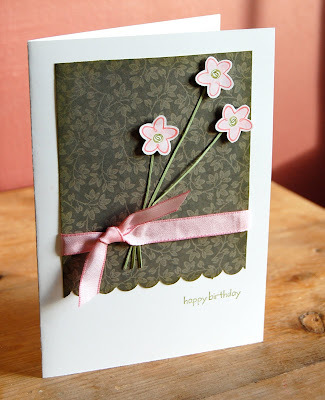 The party balloons look very joyful and your card with the flowers looks very sophicated. I like the Le Jardin DSP and the colours you used for the flowers and ribbon, some how it softens the DSP without taking anything away from it. Firstly, I love your cards, especially the first one, but both are very pretty! In answer to your question... no, it wasn't socks, it was wine glasses! I just thought it sounded a bit boring lol. Hope I didn't keep you guessing for too long! Love them both. Great take on the sketch!